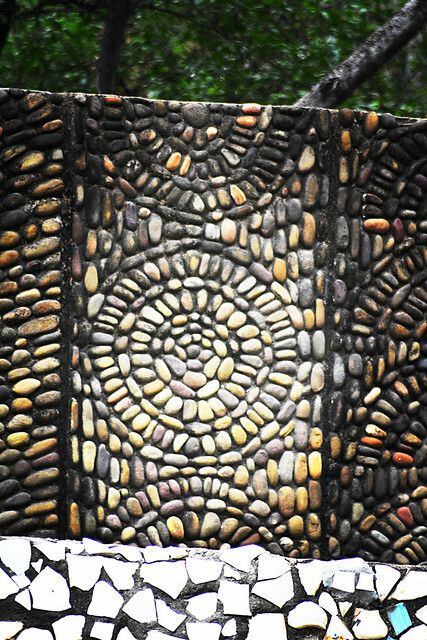 Live Your Hobbies: Article - The Rock Garden at Chandigarh, A Photographer's Paradise! 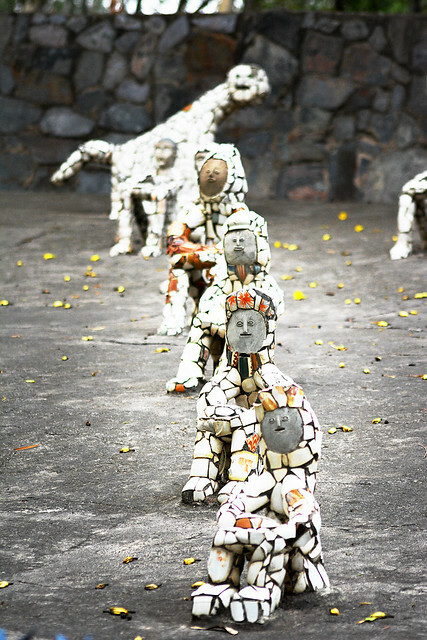 Article - The Rock Garden at Chandigarh, A Photographer's Paradise! I hope you all are having a great weekend. 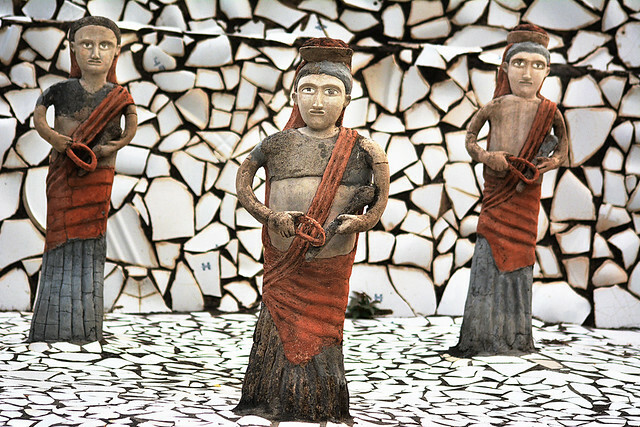 Today I am posting about the Rock Garden, an eighteen-acre sculpture garden, at Chandigarh, India. Its a treat to the eyes of Art and Photography lovers. Frame after frame, shot after shot, the expressions of the stone visages, penetrated deep into my thoughts inciting some inspiration. 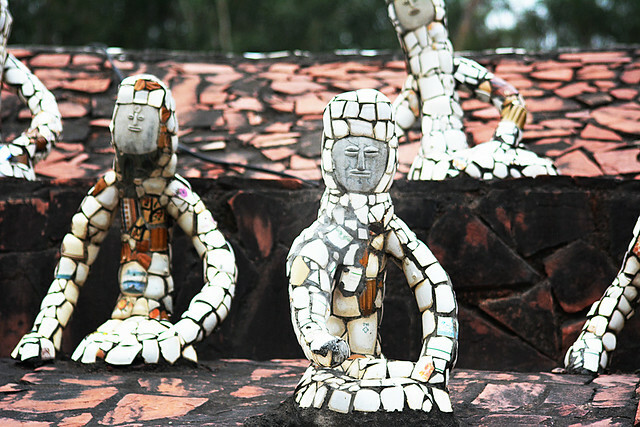 How much creativity and patience might have been invested by its creator - Late Mr. Nek Chand to turn beautiful strands of imagery into reality. He took recycling altogether to another level. 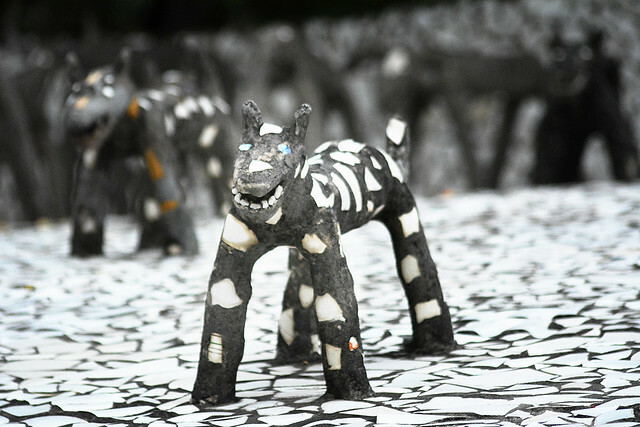 Initially he started collecting the waste materials from buildings undergoing demolition and created his own sculpture kingdom secretly at forest near Sukhna Lake. 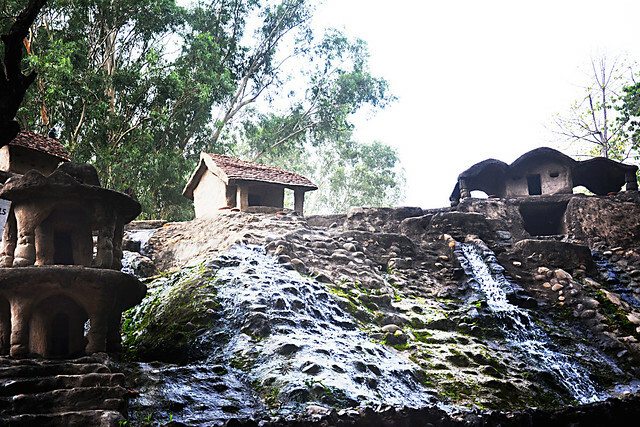 Later on, his kingdom was given recognition by Government as 'Rock Garden' because of support from public. Let me take you to a quick tour through stills from my lens. 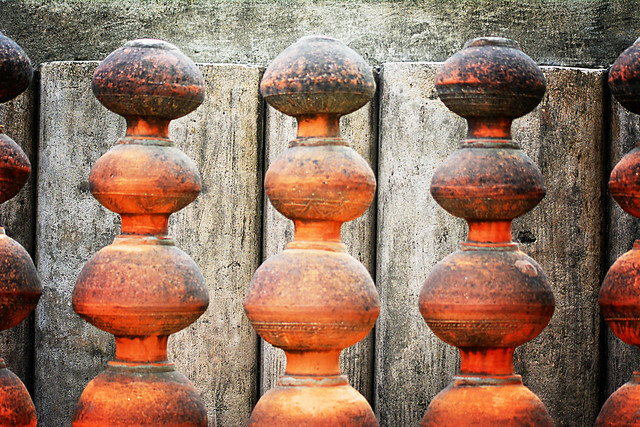 As we enter, taking steps through wavy path guarded by high walls on both the side, we see lined up army of terracotte, made up of earthen pots sitting over one another with smallest one on the top. Various patterns engrossed and the black fungal film, the gift of rain and time together, intensifies the beauty of otherwise not so appreciated as pieces of craft but as daily utility items. Moving further, enjoying the beautiful walls and pathways, the above setting captured my attention. 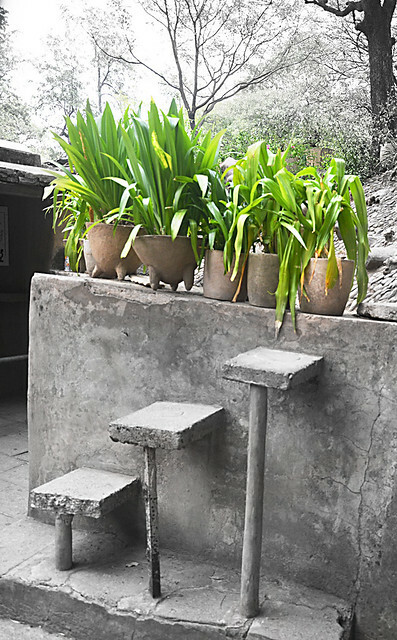 The steps seemed to be depicting progress and the green plants settled into pots of various shapes, provided an imagery of life and vividness in contrast to the concrete in shades of grey that supported these and keep them upstanding. 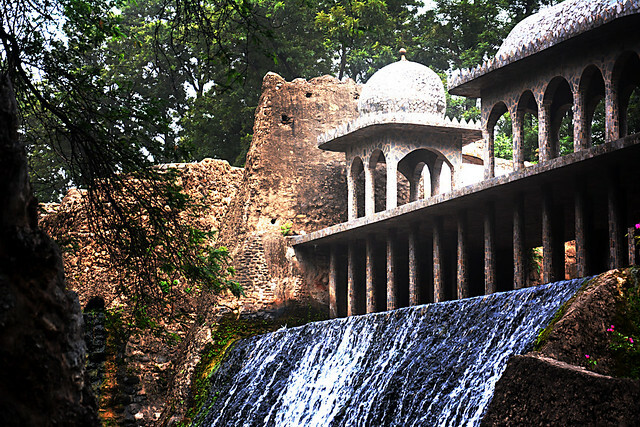 With pathways getting wider and the walls higher, we get to witness serene waterfall, with green tint of algae adding to its beauty, residing below the queue of pillars and the domes, that act as a window to the era of palaces. These structures are set up so high that human seems so timid in comparison. Tall trees with branches spread in all directions, host numerous species of birds, their chirrups adding a new hue to our auditory senses. 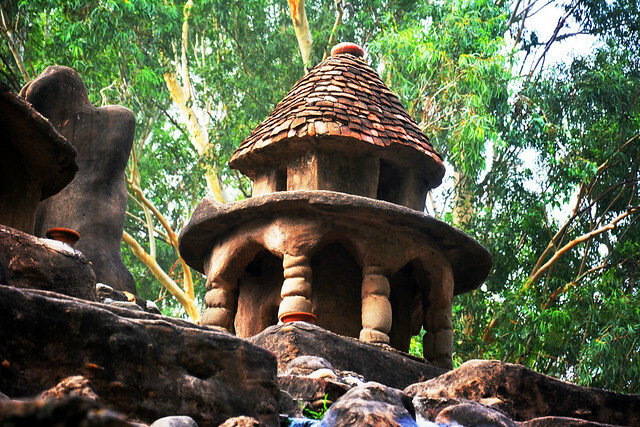 The domes and huts provide a glimpse of the village situated on a hill top. Water flowing peacefully down the slope, textured with pebbles and boulders. 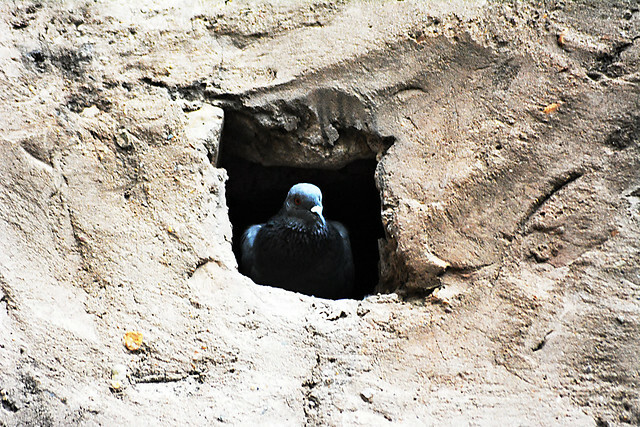 In this phase, one can spot many pigeons squatting on walls, resting in pigeon holes or drinking water from falls. This one particularly seemed curious about the spectators and hustle bustle of human forms. Another one peeping outside through hole in the wall at significant height where it feels safe enough to be out of the reach of visitors. 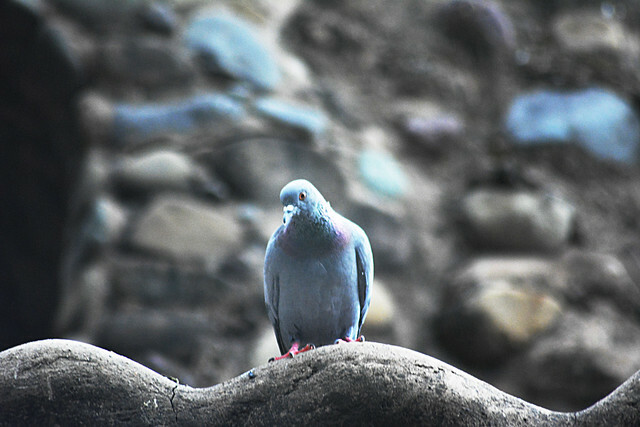 These lovely birds fill the otherwise indifferent concrete walls with life and curiosity. Moving forward through narrow lanes bordered with thick walls and bending a bit towards the ground, to cross through small doorways, suddenly you see huge arena in front of you. Elegant structures clothed with broken pieces of ceramics, keep your mind busy pondering over their shape and projection of their creator for them. 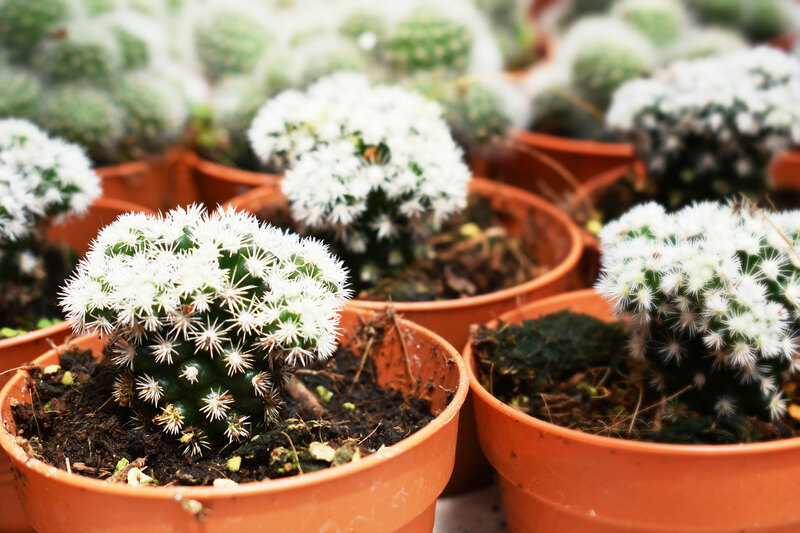 From here starts a journey of amazement of the life expressed by the inanimate. Their expressions are as mesmerising as there numbers, huge like an army. 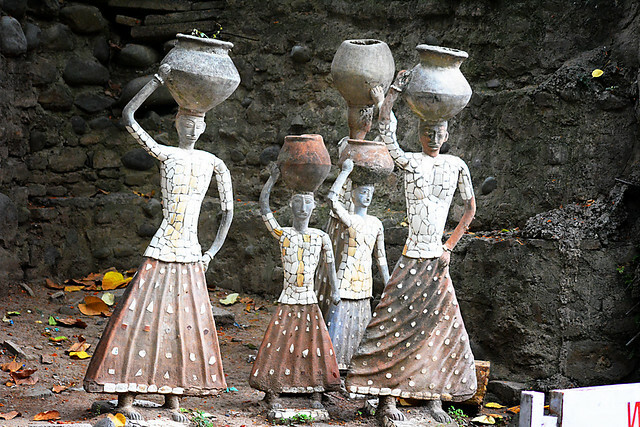 The sculptures of women, placed besides a waterfall, carrying water in earthen pots over their heads. The gigantic walls seem like waves of concrete guarding the place. 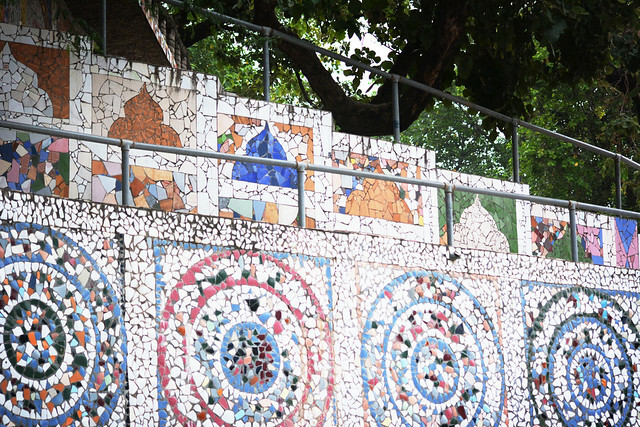 The mosaics with striking patterns and colours, how perfectly every piece fits together! 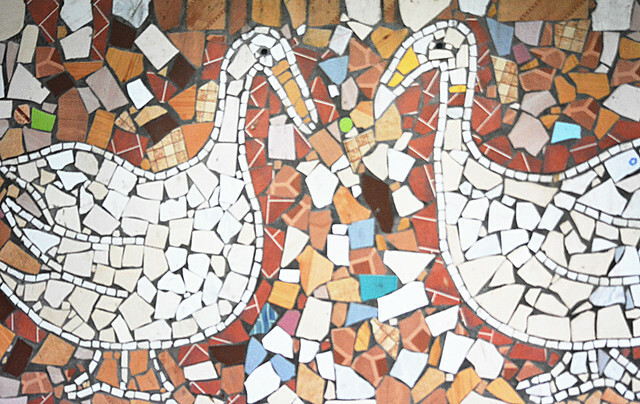 Another mosaic with two white ducks facing each other and filled with various hues in the background. 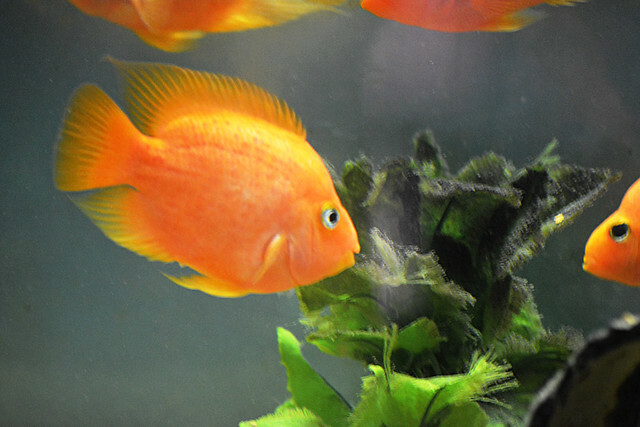 Cute happy faces can be seen in aquariums. There are more than 10 aquariums where golden fishes and catfishes reside. The Children,with their eyes glued to the aquarium glass, are specially delighted to see fishes. Again we come to the interconnected arenas and courtyards displaying army of craftsmen, musicians, women, animals and more. The one in the front, looks quite angry here. All covered with discarded urban waste. The quadrupeds with blue eyes keep you awestruck. It seems to be laughing. 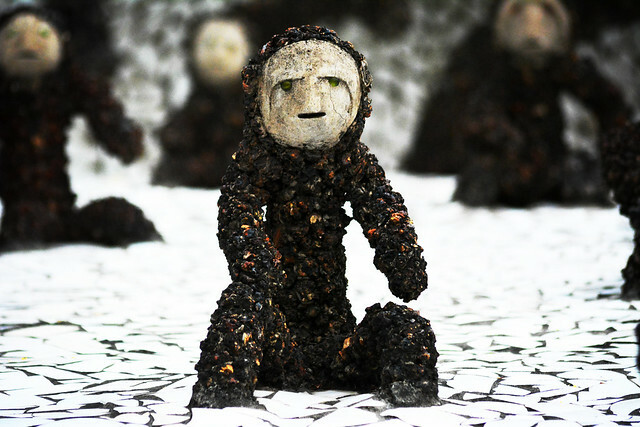 And these sculptures with their unique posture and green eyed visage, keep you pondering over for few minutes. 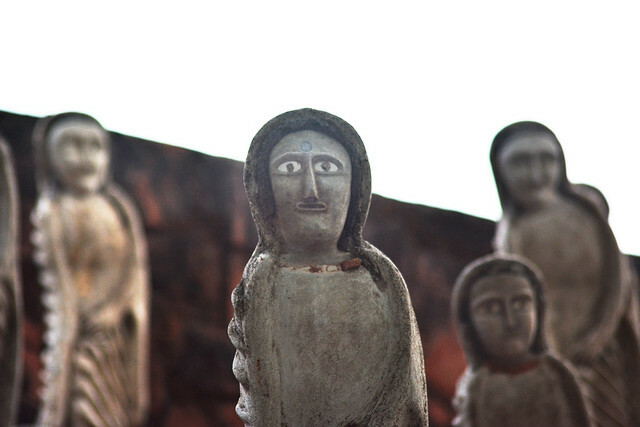 There are rows and rows of these in a squatting posture, looks like they are wondering about something. 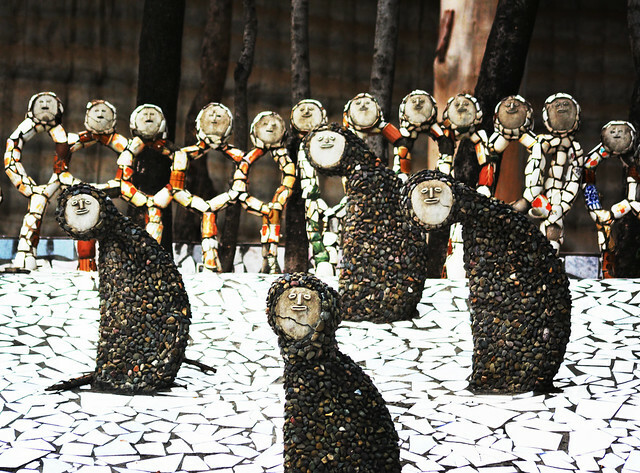 Way too high, you can see these walls embellished with pebbles arranged in circular fashion. The beautiful journey ends here and we are at the entrance again. The last click for the evening fills me with joy, to witness such unparalleled work of sculpture, as well as dismay, that it was time to leave the place and head back towards home. 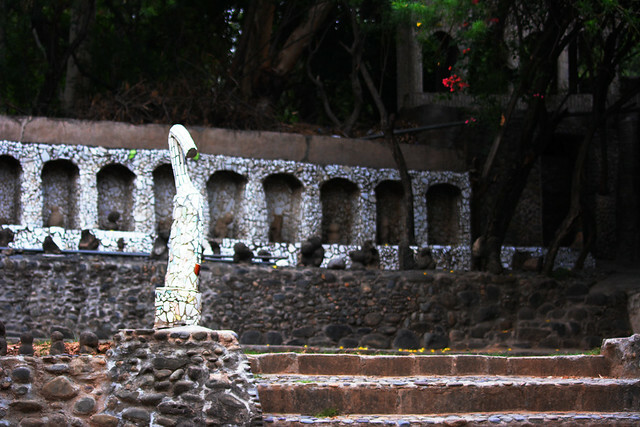 Mr. Nek Chand would always be remembered as a diligent and magical person who had the ability to bless every piece of urban waste, to become a thread in tapestry of sculpture, that are now acknowledged as revered pieces of Art. Inspired by his passion to work and toil to actualise his kingdom of dreams, I went back with the flame of hope, glowing even brighter!